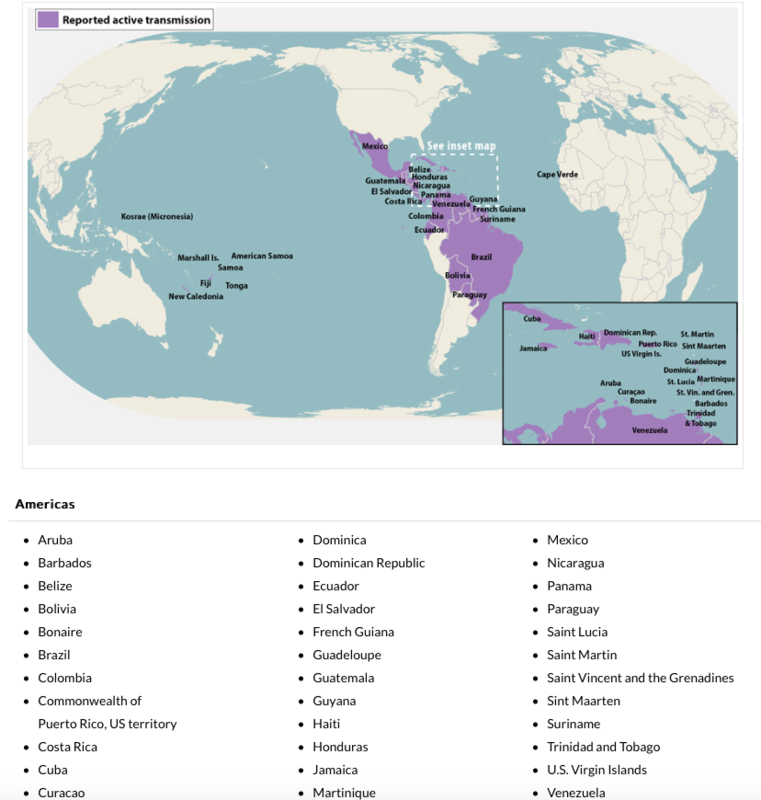 The onslaught of the Zika virus and the deleterious affects on fetus has caused understandable concern amongst travelers worldwide, but in particular those in North America, on travel to the Caribbean, South America and Central America. Some areas are more affected than others, but the question remains for those pregnant, or attempting to conceive: is it worth the risk? 60% of Americans have indicated that they would change their travel plans to avoid Zika zones. So does that mean all of the Caribbean, South and Central America are off limits? I am not a physician. Consult your doctor before going to any of those geographical regions. That being said, the CDC has published it’s map/list of Zika affected areas in those geographical regions, and as hard as it is to believe, there are still some Zika free beach-y destinations that are not as more or required as many miles asHawaii or Phuket, Thailand. With many of the South American destinations you will may to transit through an airport that is in an affected area. Always re-check the CDC site as it is constantly being updated. Do your own search; the tourism websites, if Zika free, will proudly display that (Bahamas, for example). In terms of using miles on flights, Monserrat and the main airport in the British Virgin Islands (on Tortola, EIS) only has regional island flights which can only be booked using miles on United. Using Singapore miles on the United flights would get you to your Caribbean gateway, but not get you to Tortola (via most likely San Juan). Singapore air is not partners with the regional, non-Star Alliance partner so they would be unable to book you on that flight. What about British, jetBlue and Delta? British is distance based, so it will depend on your departure. In terms of using those miles on American flights, Miami has the most non-stop flights to the Caribbean and South and Central America. That’s great if you’re starting from Miami. If you’re leaving from any other hub there may, or may not be a direct flight, especially to some of these not-as-common Zika-free Caribbean locations. Check for departures from Charlotte (CLT), Raleigh-Duram (RDU), Chicago (ORD), New York (JFK) and Dallas-Fort Worth (DFW) . 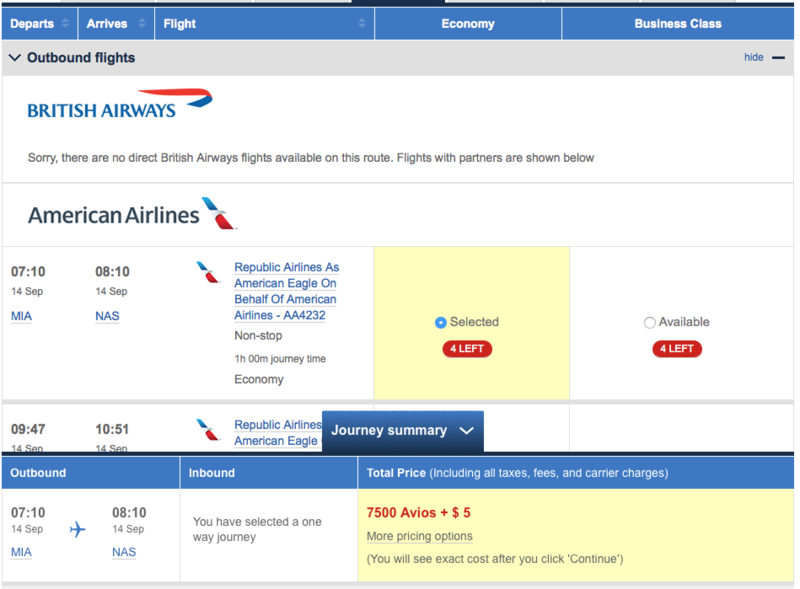 Using Avios for Caribbean getaways can be a great value, but if you need to connect via Miami or another focus/city or hub of American, British will charge you two award tickets. Like Southwest, jetBlue’s award tickets are based off of the price of the ticket. So depending on the time of year and your flexibility (as always), you can score some sweet deals… or not so good. jetBlue also operates many, many flights to many Caribbean and South/Central American destinations. San Juan is also a mini-hub for them so you can connect to some of the more remote islands via that airport. Overall, jetBlue represents another solid option to lots of these destinations with nonstop availability. If you can be flexible, you’ll get better results and cheaper redemptions. 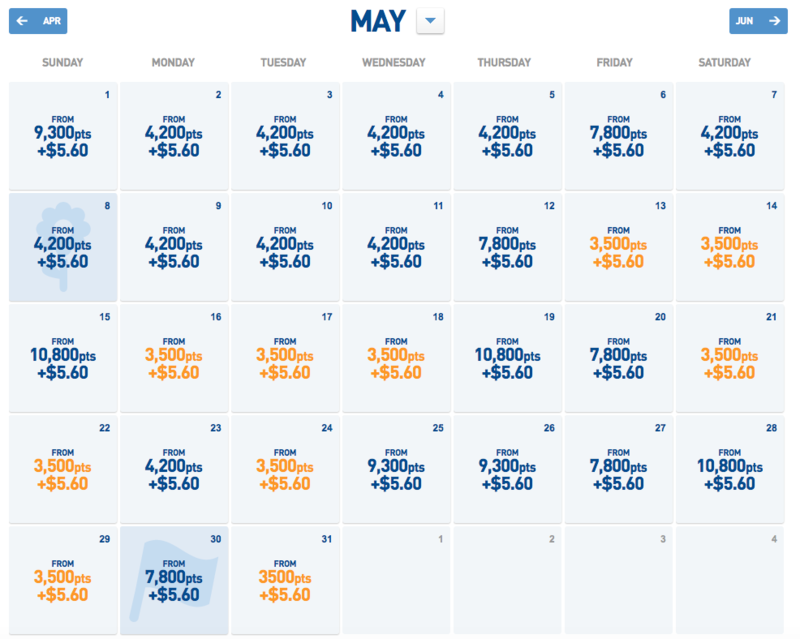 Delta is hardest to pin down as their Skymiles pricing is variable. 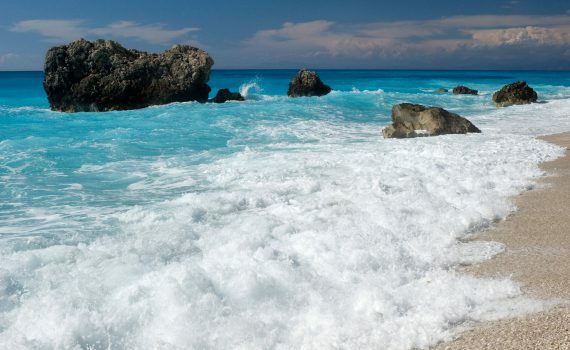 It’s very possible to find one-ways from their North American gateways (ATL, DTW, JFK) to places like the Bahamas and Turks & Caicos for 10,000 Skymiles per direction, per person. Not a bad deal. Here’s my tip: if you’re flexible, use the 5 week flexible calendar search. And always search one ways with Delta. Here’s a sampling with random dates and some of the destinations from the chart. We sure can! 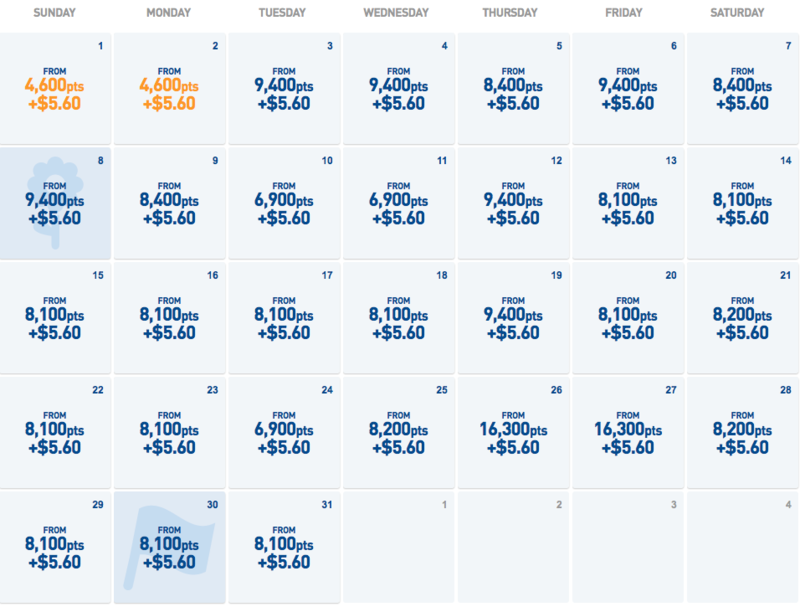 That’s just one month, for one passenger, but I’ve seen these prices at various times of the year. If the tickets are worth about $100, or even a little less, I’d jump on these if the dates and timing worked. This is not a comprehensive list of hotel options; rather, it shows a list of point options available in the location. I use Wandering Arameans Hotel Hustle tool to see availability and locations across the hotel chains. British Virgin Islands – Scrub Island, Marriott, 45,000 pts. Santiago, Chile – Hyatt 5,00 & 8,000 pts., IHG 25,000 pts., Hilton 30,000 & 50,000 pts., Marriott/Rits 25,000, 30,000 & 45,000 pts. Buenos Aires, Argentina – Wyndham, Hyatt 20,00 pts., Starwood 7,000 & 10,000 pts., IHG 25,000, Hilton 60,000 pts. Montevideo, Uruguay – IHG 15,000 pts., Hilton 40,000 pts. Ultimately, it depends where you want to go and how flexible you can be. If you’re limited to the nine or ten destinations from the Zika free zone, you now have a sense of which miles are cheapest, best redemptions, and best flexibility. And because Zika is so limiting and if it is something you may want to avoid, it’s best use this list as a starting point. So you have three hours to connect between flights and you’re flying coach. What’s there to do? Sure, you could walk around the airport aimlessly looking at overpriced magazines and bottles of water… Or, you could go into one of the many airport lounges and kick back, have some snacks, some complimentary drinks, comfortable chairs and decent WiFi. Most importantly, you’ll have three hours of relative silence from the cacophony of the airport. Airport lounge access, however, does come with a cost. 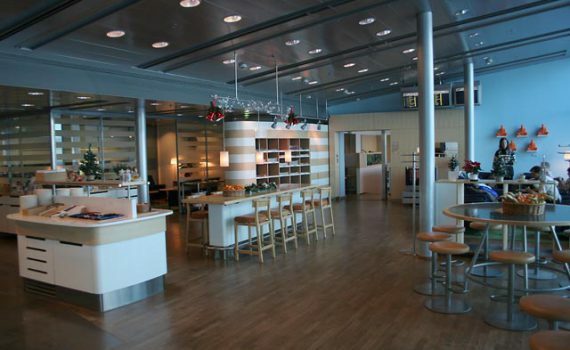 The low-cost carriers (jetBlue, Southwest, Spirit) do not operate their own lounges. While Alaska’s is the cheapest, it would only make sense if you were flying Alaska from the West Coast. Next is American’s, which has a large lounge footprint in all of their hubs and focus cities. Same with United and Delta. So cost aside, only you can decide if the cost is worth it. If you’re flying with a companion, you’d have to purchase a one day-pass per person. That’s almost $100.00! Some one-way tickets cost that much! There are full-year passes, but if you’re someone who flies that much, you may have elite airline status which can sometimes provide complimentary lounge access. 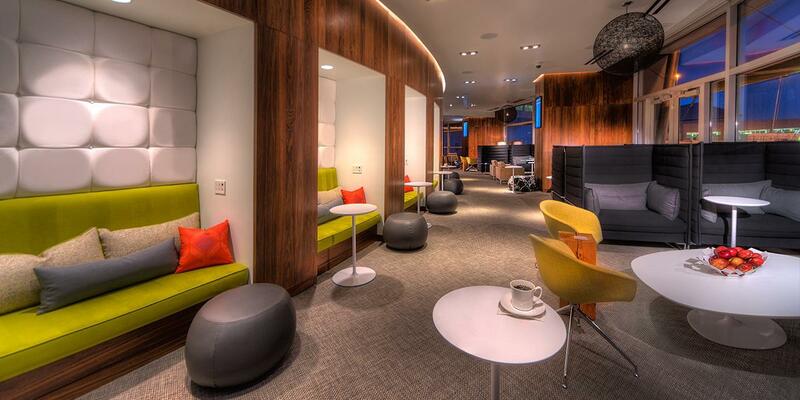 (If you have elite status with lounge access, you probably know it!). You will also have complimentary lounge access on international business and first class flights. Within the U.S. domestic first class (so New York to Dallas, for example) would not receive complimentary lounge access. The only flights that receive complimentary lounge access within the U.S. are the transcontinental (New York – Los Angeles / San Francisco – Miami) in business and first would receive it. But isn’t this about credit cards? These cards come with other benefits, but all else being equal, which one is worth it? It really depends on what type of flyer you are and how frequently you’re flying. I’d say the day pass may be worth it, say if your flight is delayed for several hours and you’re stuck at the airport. I personally find a lot of value in Citi’s Prestige card as I fly American airlines a lot domestically. 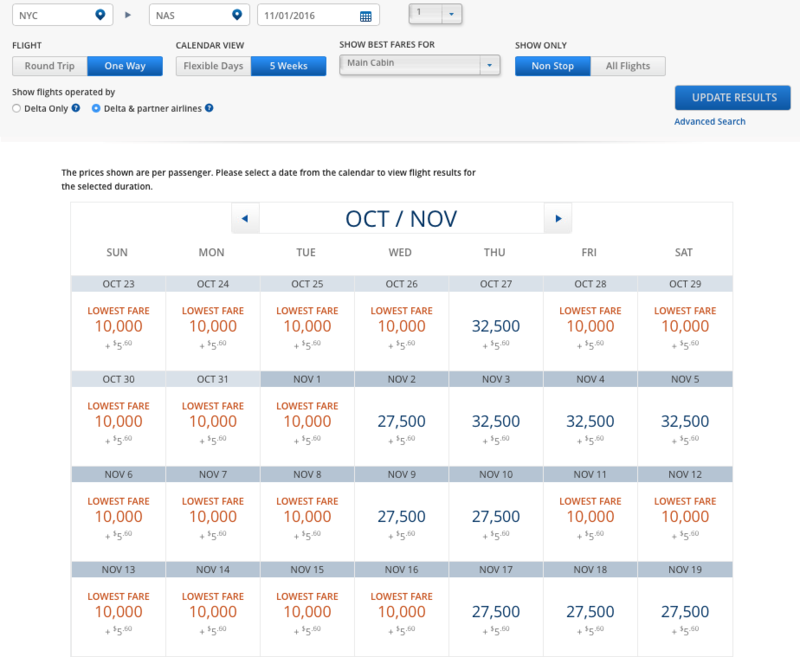 Citi (on both of their premium products) has the most generous guesting policies, too. On the other hand, the AMEX Platinum cards give access to the vaunted Centurion lounges. However, for a $450 annual fee, a charge to bring in guests on Delta and Priority Pass lounges, and a limited number of Centurion lounges, I could not justify the annual fee for that type of lounge access. It’s unfortunate as the Platinum cards from AMEX used to offer Admiral’s Club and complimentary guest access to the Delta Sky Clubs. It really is nice to be able to get out of the hustle and bustle that is an airport and have peace and quite for an hour or two before a flight. The complimentary drinks and food are an added benefit. But what did we all do before lounge life? We sat around the airport killing time just like everyone else. And when anyone flies Southwest (if they have that companion pass!) then you usually don’t have any type of access. So, like anyone else, you just deal. When the time comes to pay my annual fee on the Citi Prestige card, it will be a tough call because of the lounge access provided that I’ve taken advantage of internationally, domestically and with long layovers. Note: I am not a rabbi and the opinions related to keeping kosher are my own, based on my experience and asking my own rabbis. A common question I receive from those who keep kosher and those who do not, is how we keep kosher while traveling. In some places, like Israel and countries in Europe (London, Paris), it’s fairly easy to find an abundance of kosher food. In others, like many smaller islands in the Caribbean and a lot of countries in Asia, it’s a bit harder. A lot of the popular countries have a Chabad that supplies kosher food for the Sabbath and/or a restaurant to travelers wishing to keep kosher. Do your research beforehand–many Chabad’s have their own small restaurants, but about a month before your trip, shoot them an email to confirm that they will be open, what their hours are, do you need reservations, etc. This will ensure that if you show up… that they are actually open! The leniency of cholov stam (lit. “plain milk”) does not apply to every country (Beijing, China, for example); so be sure to ask before you go. If you are going somewhere where this will be a problem, you can bring your own dehydrated milk or powder based creamers which do not need to be refrigerated. 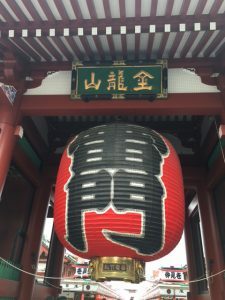 Before every trip where keeping kosher is difficult, I make a menu itinerary that includes columns for the day, the meal and what activity we’ll be doing. This way, if we’re going to be on a day trip, I know that I won’t be heading to the Chabad for lunch or dinner. Dry goods such as protein and granola bars, granola, nuts, oatmeal and cereal can go a long way. They’re filling and can help you keep up your energy (unlike chocolate, chips and cookies!). You can purchase the above items at foreign/American grocery stores, but they are pricey. Soup cups are key, especially where ramen is the norm. Do not assume that because something is certified in the U.S., that it is certified abroad. For example, Kit Kat sold in Japan are made in Japan and not imported into the country so they do not bear any certification. They may taste the same but the ingredients can be different which may require certification. When going grocery shopping in some countries, think outside the box. For example: getting kosher food in Hawaii can be difficult, but it’s still part of the U.S., so things like Morning Star do exist! Eating fresh fruit and vegetables (uncut) is usually okay in most countries. The restriction to not eat it, like in China, is not because it’s not kosher. The restriction exists because of washing products with unfiltered water. They fit really well inside any type of sustainable cooler bag that is large enough to hold a good amount of food, keep it insulated for a good lenght amount of time and stay frozen for several hours. Here’s the bag I used. It seems bigger than it is when you first open up the box, so you may want to go a bit bigger. This size fit perfectly on the plane. And on the way back, assuming it’s empty, it doubles as a nice carry-on ;). For our pre-packaged meals, we used these containers that are microwavable safe. I can’t get enough of theses! They come in bigger shapes and different configurations, too. Only being in Beijing for three days, I knew that our kosher situation would be a bit easier. Though there is a Chabad, it’s not centrally located (at least to our hotel, which also was not centrally located); it does deliver, though. Aside from that we had the usual suspects: peanut butter and jelly, Morning Star patties, cheese sandwiches. We also pre-cooked and packaged some pastas that we were able to keep in the mini-fridge in our room. These were great for the evenings we were too tired to go to the Chabad for dinner. 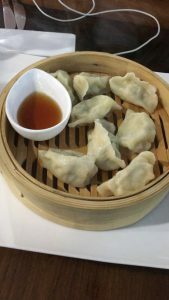 Kosher dumplings in Beijing — The real deal. As I mentioned above, the leniency of chalav stam did not extend in Beijing, so we drank black coffee most of the time. Had I known this before hand (and listened to my own advice), I’d have brought liquid or dry creamer. You live and you learn! 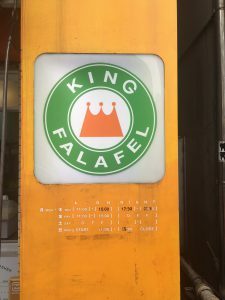 There is a second kosher falafel restaurant in Tokyo, called King Falafel. The falafel was delicious, prices were fair, but the location is a bit out of the way. If you’re nearby, it’s definitely worth a visit. They are open Monday – Friday and only for lunch. Call ahead to confirm. Unlike Beijing, the leniency of chalav stam does extend to Tokyo, at least, so we were able to drink coffee like we’re used to. Something that is somewhat controversial are vegan and vegetarian restaurants. In Tokyo (and Japan in general), contrary to popular belief, those types of restaurants are a rarity. Not only is vegan, vegetarian and kosher hard to come by, so is halal food. Any sort of dietary restriction is pretty difficult to accommodate without bringing your own food or going to the same restaurant everyday. So that’s exactly what we did, plus the above mentioned items. Snacks are also difficult. 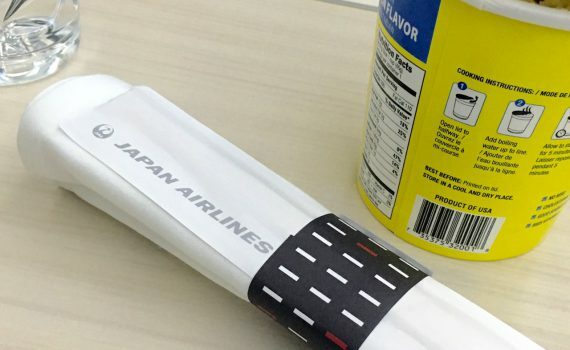 Most products in your generic grocery store are not imported; rather, made and manufactured in Japan or surrounding countries. This means that they would not be certified kosher. In fact, the Chabad informed us that even if the ingredients are the same, the product can be problematic. Oh, well. Fish is a major food category in Japan. That being said, you can purchase raw kosher fish from the market and have your hotel double wrap it and bake it–if you’re comfortable doing so. There are good kosher travel meal options out there (Pomegranate), but for this trip it didn’t make sense, considering there were local charades with restaurants. (A future post on the different kosher travel to-go meals). With what we packed and the restaurants, we never went hungry. Next time, I’ll bring more snacks. 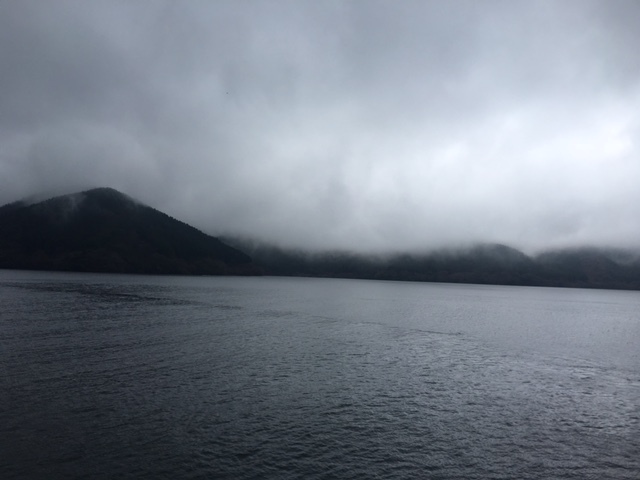 Though comprehensive trip reports can be interesting… I find them to be too much and too long to read, and boring. So that’s why I provide highlights for each location. 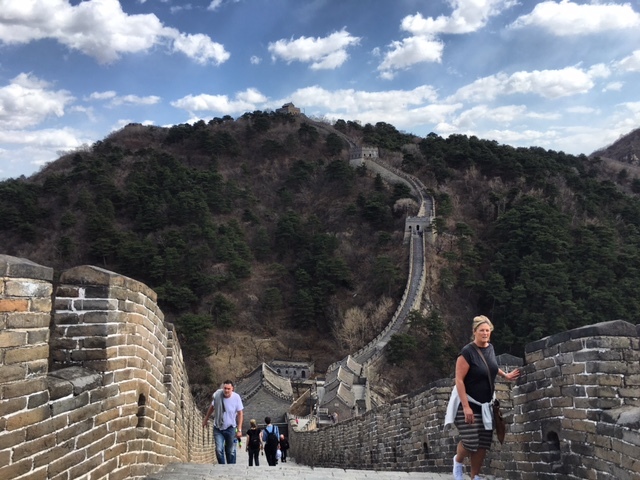 After spending three nights in the busy city of Beijing and seeing ancient sites such as the Great Wall of China, we hopped on our ANA flight from Beijing Capital Airport to Tokyo-Haneda Airport. 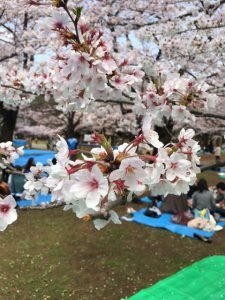 We planned to go to Tokyo specifically during Spring to take advantage of the Cherry Blossom festival and atmosphere around the city… and boy, did we luck out. The weather could not have been more perfect (with one rainy day) and we were able to see the cherry blossoms in all their glory. I found Cathay Pacific’s business class to be overrated (blasphemy, I know) and Japan Airlines’ Sky Suite business class to be excellent and super comfortable. 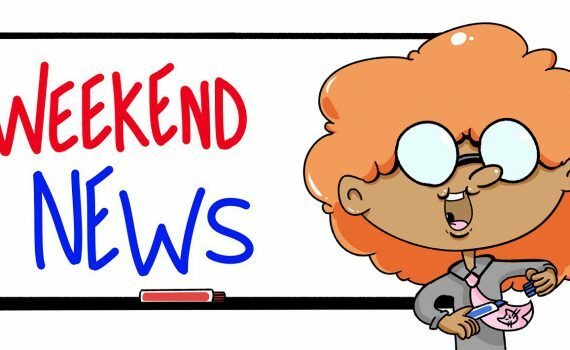 You can read reviews here and here. 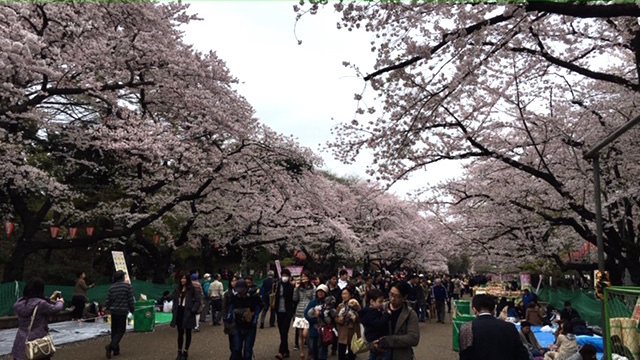 The hotel was part of a larger hotel complex (with 3 or 4 other Prince properties) and in between them was a small cherry blossom park. One of the hardest things about going to a new country is getting around–car rental or public transportation. 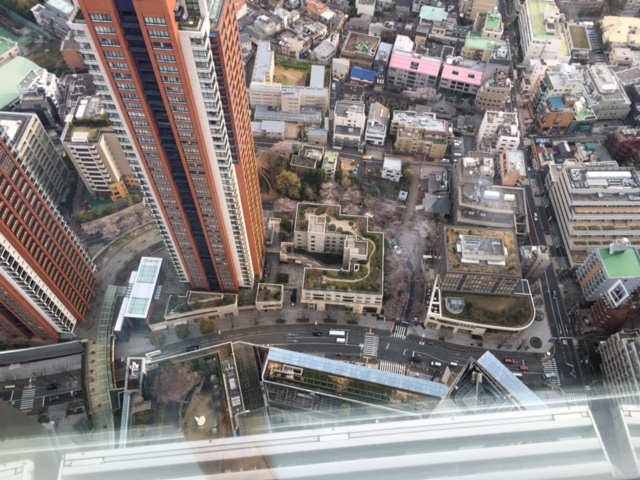 Luckily, we had Google maps as part of my global Spring data plan, which partners with carriers worldwide (except in China), giving me sufficiently fast 3G speeds. And, unlike China, we used the transit system extensively. It is extremely efficient, clean and a overall pleasure to take. Prices are comparable to other major cities ($1.25 – $2.75 USD per direction). They can all be rode with one reciprocal pass that you can load, or you can get a one-day pass to ride the subway and metro for 1000 JPY ($9.26 as of this writing). PLEASE NOTE: You cannot use credit card for the single tickets, only for the reloadable card. So I put those “activities” down and then got to the neighborhood, not really knowing what to do. We quickly rectified this by planning even more after our first day and in preparation for our next day. 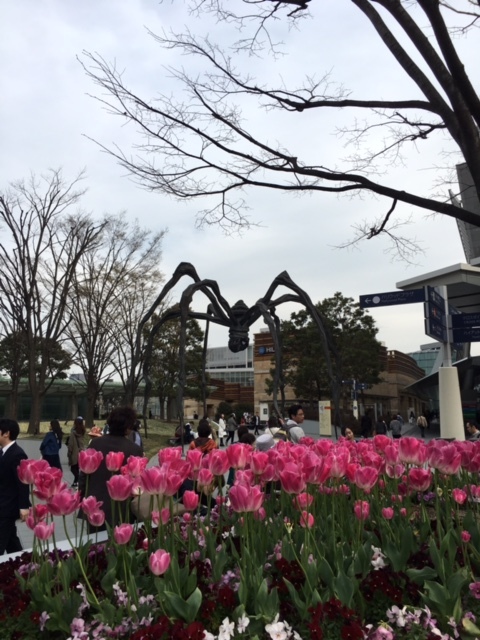 Mori Art Museum — A really cool, modern art museum with some unique and interesting exhibits. 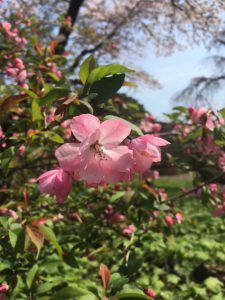 It shares the grounds with two other museums, and a sky tower that on a clear day, gives a wonderful panoramic view of the city. Shibuya Crossing — Sheer and utter madness. Really fun to watch and participate in the mad dash to cross the street where 2,500 people cross at one time during rush hour. Mt. Fuji / Hakone National Park — Unfortunately, this was the one day it was raining and extremely foggy so we could not see more than several feet in front of us. Oh, well. 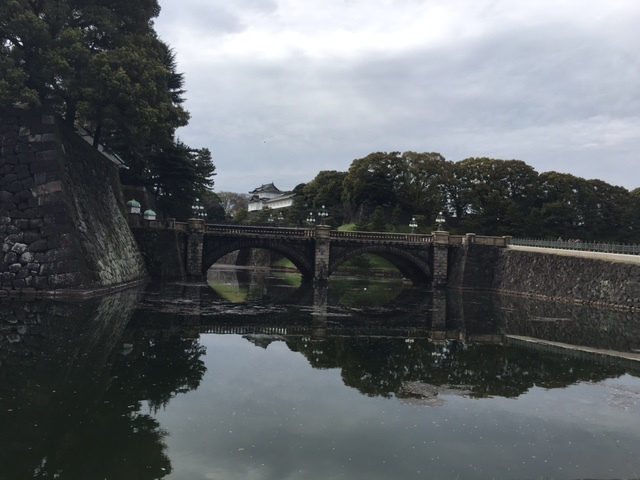 Imperial Palace – The inside of the palace is closed on Mondays, but most people just like to take pictures of the famous bridge and enjoy the constart of Japanese shogun architecture, to modern day construction. Indeed, it’s a sight. 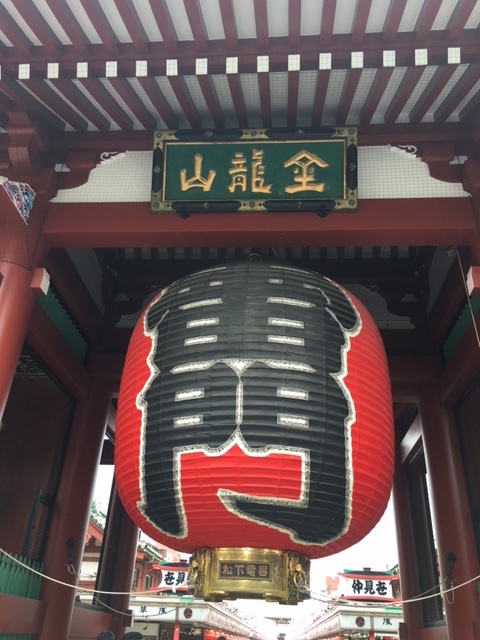 Asakusa Shrine — Perhaps one of the most famous shrines in Tokyo, a tourist trap, but cool outdoor market to get souvenirs and other stuff. Ginza – I’d consider this to be the Fifth Avenue of Tokyo. High end shops with a lot of neon lights. 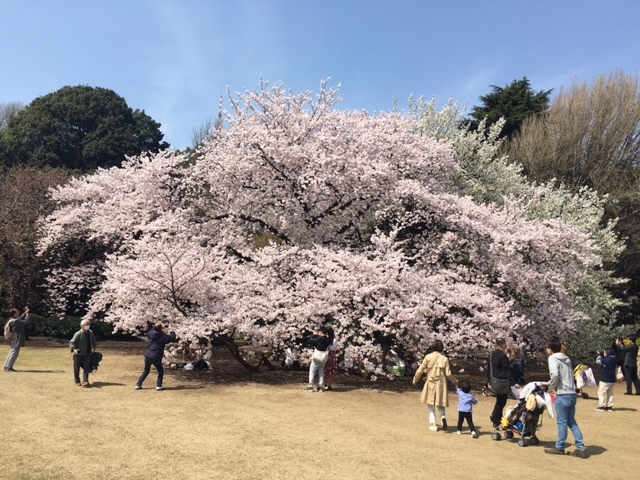 Tokyo takes pride in the fact that is has four distinct seasons, and in each season they celebrate the beauty of the greenery and parks. 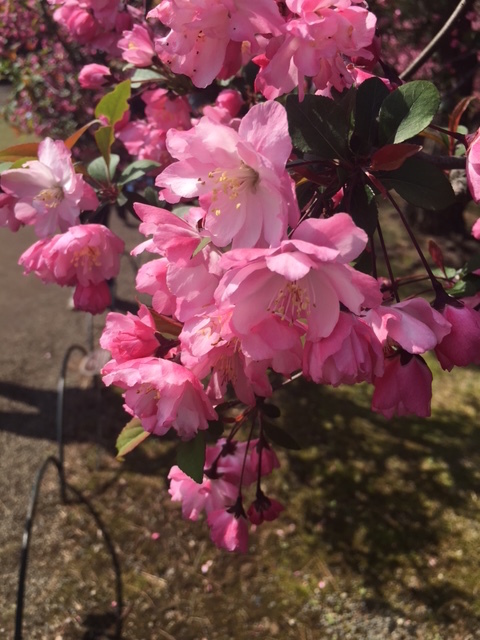 However, the Cherry Blossom, or Sakura, is something that is unique to Japan due to the large amount of cherry blossoms that bloom at the same time. 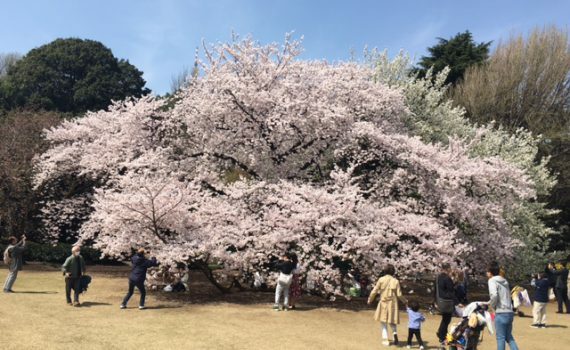 They have an official Cherry Blossom tree that “rings in” the festival and the national tourism symbol is a cherry blossom! Most definitely! Already trying to figure out the next time we can go there. Tokyo will host the Summer 2020 Olympics and I think it’s a great choice, considering their advanced transportation infrastructure. There are also a lot of other cities that I’d love to see; Osaka and Kyoto in particular. Our Hong Kong – Beijing leg was in angle-flat business class seats. This was my first class in that type of product as I’ve always had the mindset that when flying business it’s either lie-flat, or coach. This flight changed that for me. Angle-flat is better than coach. We slept like babies. The Doubletree by Hilton Beijing was excellent: cheap redemption, courteous staff and really clean and well kept hotel and room. As a Diamond member we were upgraded to an executive suite. The hotel is a bit out of the way, but with only two full days on the ground it did not really matter. Would stay here again, unless I was there for a longer stay. 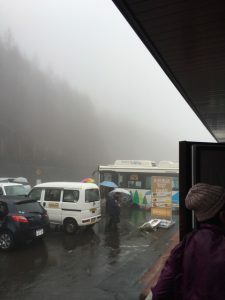 One of the hardest things about going to a new country is getting around–car rental or public transportation. One of the more difficult things about China is the firewall, punily referred to as the ‘Great Firewall of China’. Essentially, this firewalls blocks all the good stuff most of us are used to, like Facebook, instagram, and Google maps! So how did we get around it? For $0.99 a week (and we were only there 3 days), you can get VPN-Shield app in the iTunes or Android app stores. It will connect you to a different server, “ghosting” your location so you wouldn’t be blocked from the above sites. In terms of connectivity, I rented a MiFi device for a week with more than enough data so we could use our friendly apps on-the-go, but also have access to Google Maps and Uber. Uber’s are super cheap in China (like $5.00 for a 45 minute drive), but because addresses are complicated, the driver will want to call you to confirm your location. So even if you did speak Mandarin, you’d need a SIM card to receive those calls. In any event, we probably spent around $50 on six uber rides (that would be about quadruple in New York City!). If you’re there for longer, or more centrally located, you probably would rely more on public transportation. 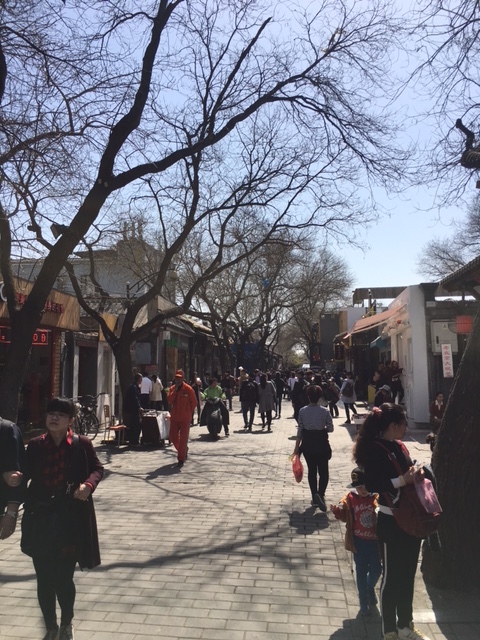 Beijing is a massive city with a large (read: too big) population. 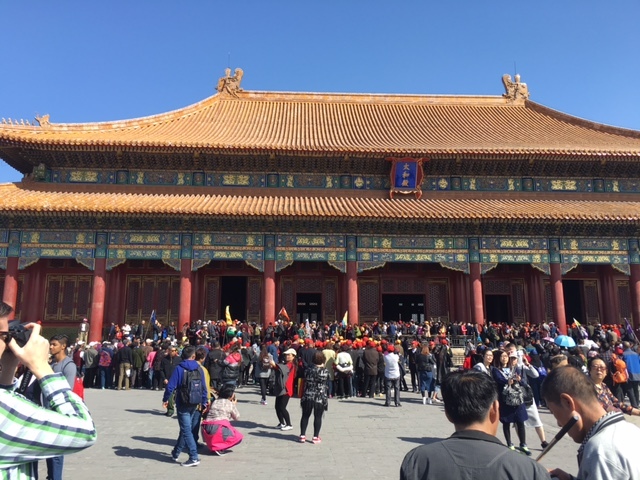 The country of China has a population of 1.3 billion people, and is roughly the same size as the U.S., which has a population roughly 1/4 of China. There is always traffic, and always a hustle and bustle. Much like New York City. But with more people. 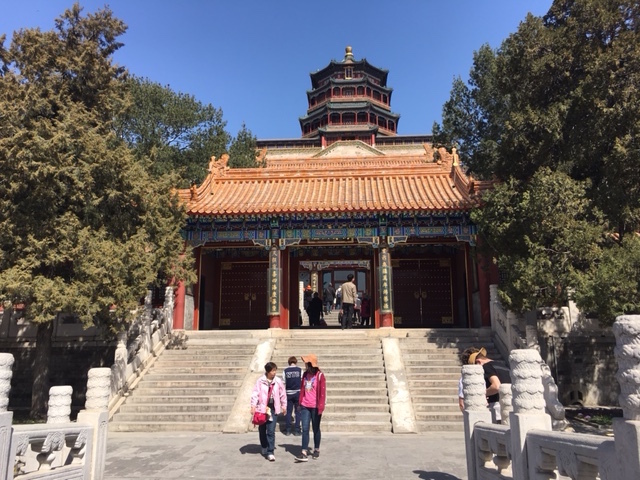 There are a lot of remarkable cities in China and a lot of wonderfully exciting sights within each city. We were able to hit the landmarks within 2-3 days, and I think it’s pretty doable. 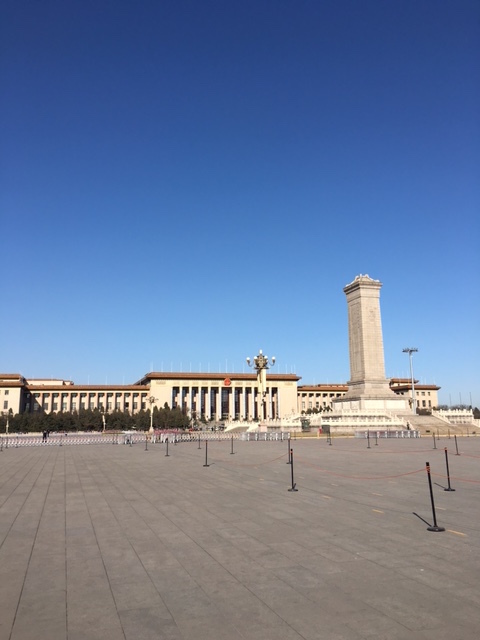 Would I go again to Beijing? Probably not. 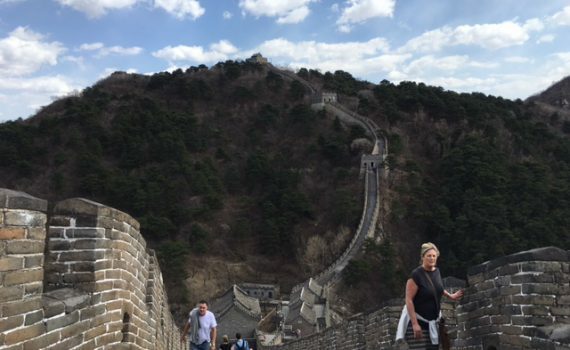 Should you see the Great Wall? Yes, if that’s of interest to you. Do you need a long time? We didn’t, but you may! I intend for this post to be weekly, but as we were away… No time like the present! The Hilton Surpass card has been upped to 100,000 points, for spending $3,000 in three months. This is the highest it’s ever been…. And what to do if you recently applied for this card, before the increase. 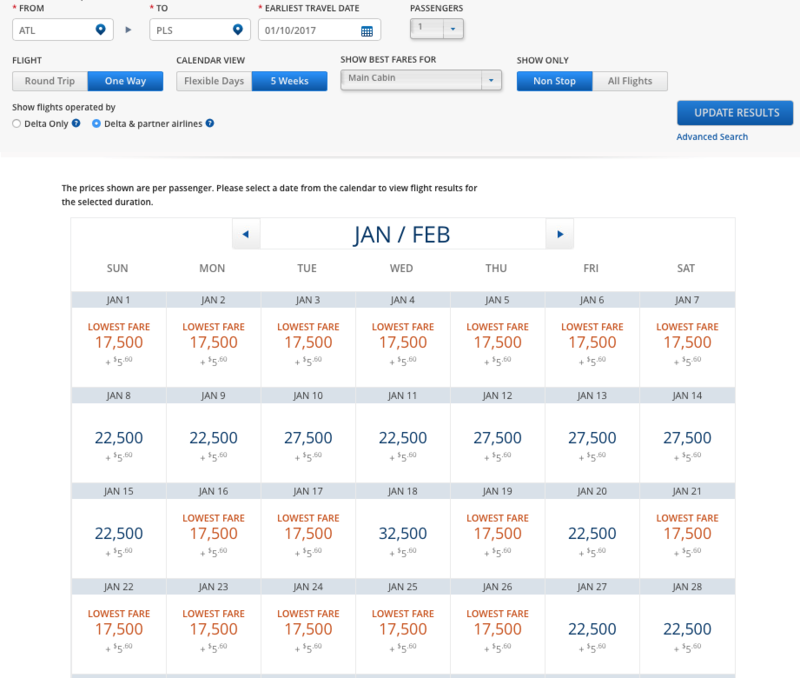 Alaska doubled (from 100,000 to 200,000) Emirates first class redemptions. And then blamed it on travel hackers. Can’t say I was too surprised. But will allow one-time changes that honor the old award chart. Anbang, the Chinese investors, officially walks away from their Starwood bids. Of course someone else can come along, but that’s doubtful. Oh well. Gary Leff at View from a Wing has an interesting analysis on the future of hotel mergers. Speaking of mergers, it’s been announced that Virgin America will sell and merge with Alaska Airlines–what will the future of these points and miles be? 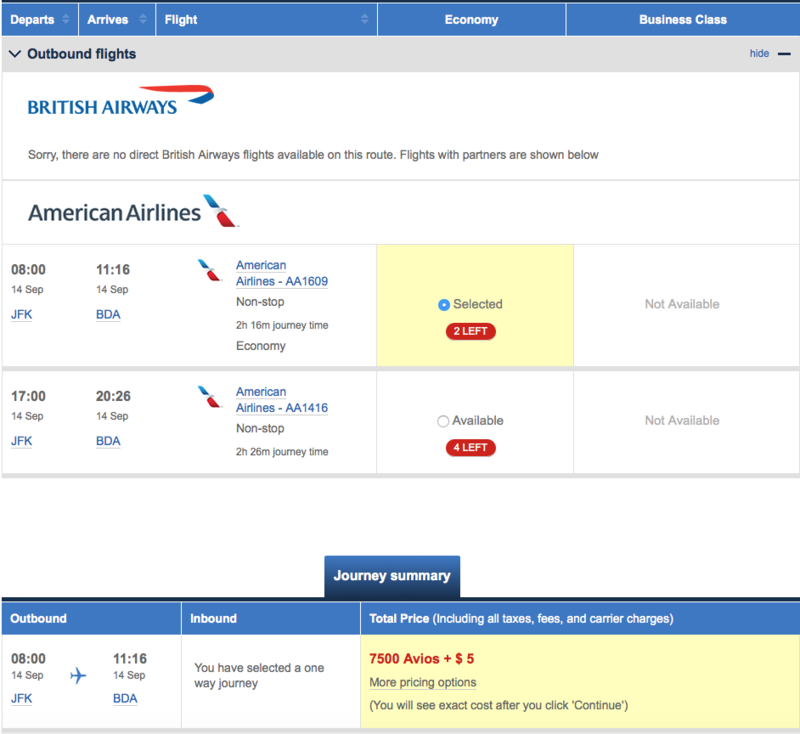 American has gotten rid of their 24 hour holds in favor of the 24 cancellation policy. This only applies to revenue (cash) tickets. I think this is a good thing; their other policy was confusing and misleading. This will NOT affect award ticket hold policies, however. Marriott’s cash and points options are now available… if you can find them. Match to Hilton Diamond until 2018–this was really useful on our last trip! 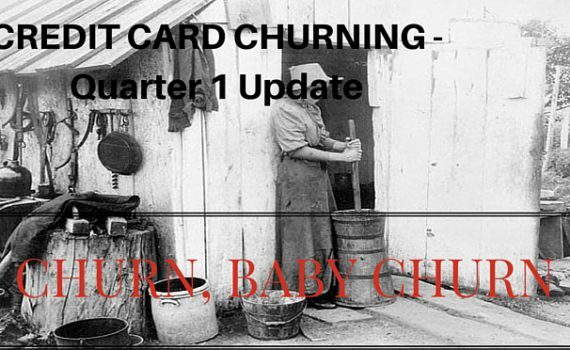 Quarter 1 of 2016 will be coming to a close and I wanted to provide my lovely readers with an update on where I am with card churning this year. 335,000 points, 2 nights and 4 credit cards. What attributed to the substantial gain this first quarter over Q1 2015? Three, 100,000 sign-up bonuses. Tiered bonus: 50,000 points after spending $2000 within three months; 25,000 more points after hitting $10,000 spent; then 25,000 more points after hitting 20,000 spent. What Cards To Get Now? Remember, there are some limited time offers that include the SPG, Marriott and Hilton cards (all those have been applied for in either or both years) and some others that I applied for because of anticipated use. Other cards, like AMEX cards which earn Membership Rewards are always valuable because they can be transferred to multiple partners. Some of these points and spend are still pending or in the process, but Q2 and Q3 for me this year (yes I’ve planned them out) will be slow for me for a variety of reasons, but I’ll certainly pick it back up in the end of Q3 and throughout Q4 to probably come to the same amount as last year. What are your churning plans for this year? This month?